Item number 2956/200 a from the MOA: University of British Columbia. 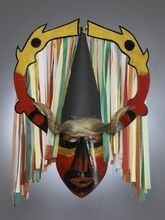 Large mask made of cardboard with a protruding nose and horns on the forehead. Large headdress consisting of a tall black cone-shaped cardboard hat and semicircular cutout pieces on each side, surrounded by multi-coloured streamers. 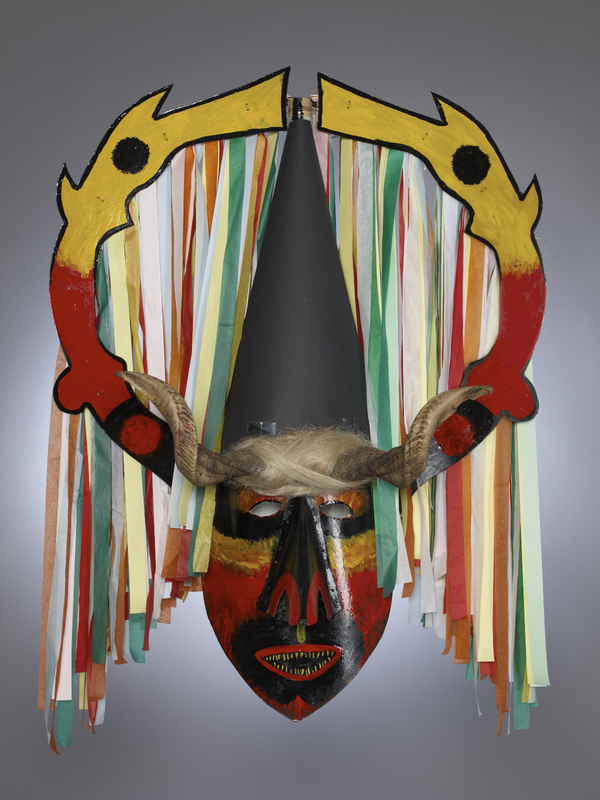 The mask is part of a costume that also includes a white shirt (2956/200 b), a red skirt (2956/200 c), a white apron (2956/200 d), a red sash (2956/200 e), a mask (2956/200 a), and two bells (2956/200 f-g). paper, horn, fibre, metal, wood, plastic, paint, adhesive and hair ? paper horn fibre metal wood plastic paint adhesive hair ?